So, how do you make a low budget film, simply based on one man in a car, calling family, clients, colleagues and other relations the slightest bit intense and dramatic? Answer: you make that man Tom Hardy with a Welsh accent. On the eye of Ivan Locke’s (Tom Hardy) biggest challenge of his career as a construction manager, he gets a call which turns his night and his life upside down. Believe it or not, the entire film consists of Ivan’s journey from Birmingham to Croydon in a BMW and his communication with others through a Bluetooth phone connection. 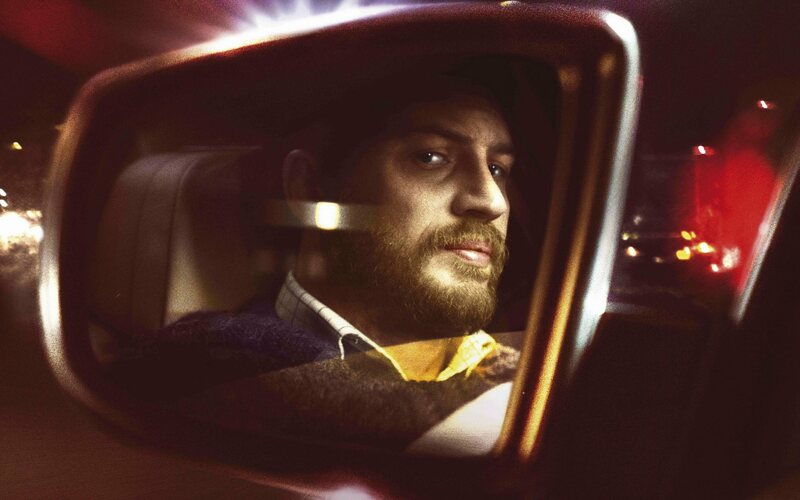 If it wasn’t for Tom Hardy being a superb actor, and giving the viewer a great representation of a drama-filled hour and a half drive in the UK, this film would be receiving an incredibly low rating from me. This is an unusual approach to film-making from Steven Knight who has also directed Hummingbird (2013), Dirty Pretty Things (2002) and award winning TV Drama Peaky Blinders (2013-Present), but that seems to be his genre. It personally did not overwhelm me with excitement; however it did do well at portraying an emotional journey for the average man. I felt as though it was missing something throughout, but this could be due to Knight wanting to create a more realistic and minimalistic film that the likes of troubled British people can relate to. The simple, but dramatic moments where he screams, hits the steering wheel and talks to his imaginary father, who he had a very distant relationship with, in particular, emphasise this. The narration in this film is so constant hat when he is not on the phone, and instead talks to himself, we realise the levels of drama that engulf his life. In summary, this film is a good example of how a guy’s life can change dramatically in the space of one car journey. It’s a short watch, so the concept does not drag for the viewer too much, however I strongly believe that without an A-class actor like Tom Hardy in the picture, this film would have not received any recognition at all, and it is certainly not one I will urge people to rent or watch. One thing is for certain though; I need to get the Bluetooth phone connection sorted in my car ASAP! Recommendation: Do not rush to see this film or plan a night in to watch. If you have some free time, and you have got Netflix, give it a watch! Otherwise the only reason I think you would want to buy this film is if you are adding to a Tom Hardy collection – I will now be saying that that is the reason I bought it!